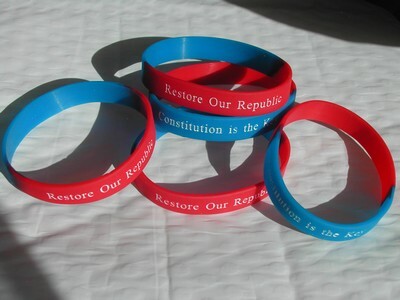 Lot of five items: Silicon Rubber wristlets that are red and blue with white text that reads "Restore Our Republic - Constitution is the Key" Great stocking stuffers for the American Patriot. Lot of five items: Silicon Rubber loop key chains that are red and blue with white text that reads "Restore Our Republic - Constitution is the Key" Great stocking stuffers for the American Patriot. Not for children under 8 years of age, choking hazard parts. Shipping, handling and Ohio Sales Tax (if applicable) are not included in the price listed, they will be added during the checkout process.